Would You Pay For Search? I would like to hang out with your small group and talk about what technology wants. Last year to promote the launch of my book What Technology Wants, I offered to appear at your place of work in the month of January and give a one hour talk if your group would purchase 25 copies of the book. This arrangement was a rousing success, not the least because I had the opportunity to visit so many organizations I would not have otherwise met. The diversity and quality of the groups that I met with was amazing, and matched by the quality of the conversations we had. I think it worked out well for everyone. The only downside to the whole month was that I had to restrict the offer to the San Francisco Bay Area. Many groups outside CA, and outside the US were left out. Now, to promote and discuss the new Penguin paperback publication of What Technology Wants, I have a related offer good for anywhere in the world. For seven days next month I will be hosting a series of small, 1.5-hour Google+ Hangouts with any group that purchases 9 paperback copies of my book. Each Hangout will be limited to 10 participants, which is Google’s current cap on participants. 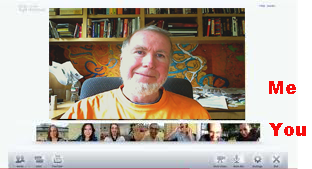 A Google Hangout is like a Skype session but with 10 people, in ten windows on your screen. For 90 minutes I will discuss what technology wants and anything else the group wants to talk about. The group of 9 (I am the 10th) can be any gathering of colleagues, co-workers, enthusiasts or friends that you want to put together. This is also an opportunity to explore video conversations, webinars, telepresence, and video chat for small groups. The sign up page and the particulars are here.